I must have been seven years old the first time I made butter. I am sure it had something to do with earning a badge. All I really remember is the torturous time I spent shaking a baby food jar waiting for the magic to happen. I was then rewarded with a dab of butter on a saltine cracker…not bad for an afternoon’s work. 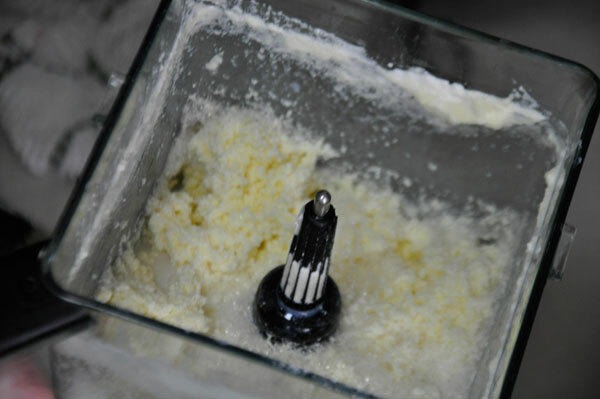 Thankfully, modern day butter making is so much quicker and doesn’t require the muscle power it used to. In fact, I can whip out a pound of butter in less than 10 minutes. 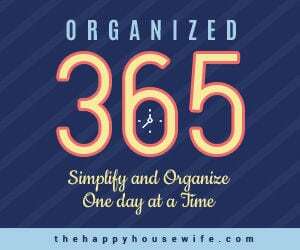 Here’s how I do it. Yield: Approximately 1 pound fresh butter and 2 cups buttermilk. 1. 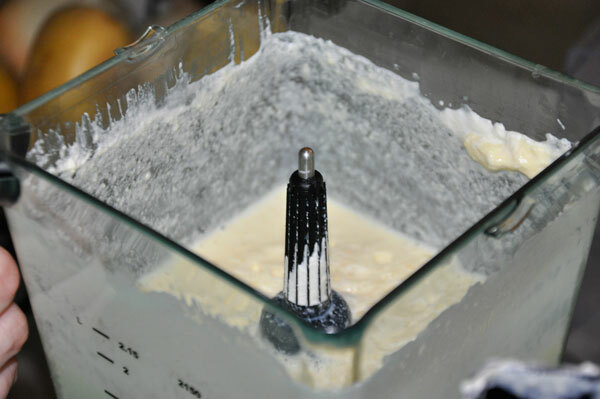 Pour cream into blender. Blend on high. 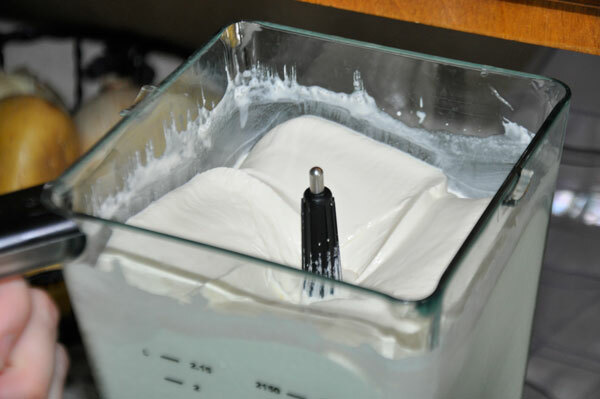 Cream should become stiff and foamy, creating whipped cream. 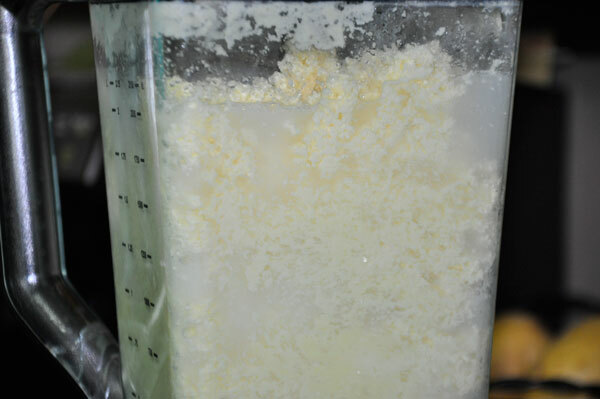 After further blending, the fat globules will begin to separate causing the cream to appear grainy. 2. 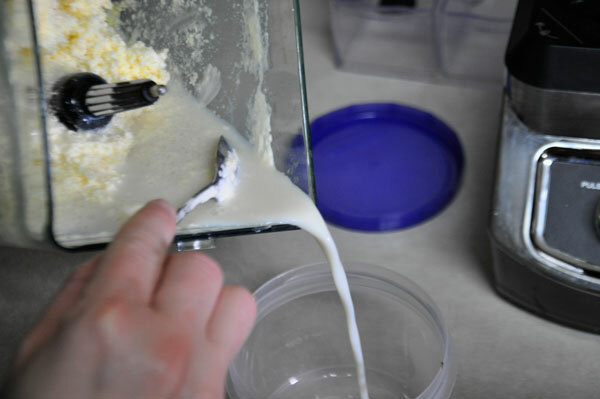 Continue blending until butter has come together and formed a solid mass. 3. Drain buttermilk into a container and save for future use. 4. 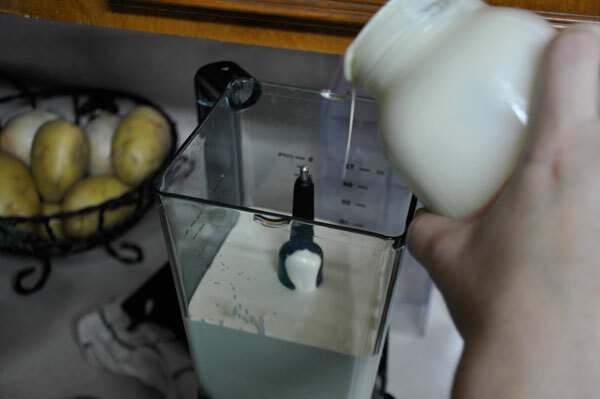 Pour a quart of ice water (minus the ice) over the butter in the blender. Blend on high for approximately 30 seconds. Drain water and repeat. This rinses all the buttermilk from the butter and helps the butter not sour. 5. Place the butter in a large bowl. Press the butter to remove any excess water. Salt the butter to taste (remembering that the butter will get a bit saltier as the salt melts into the butter). Mix well. 6. 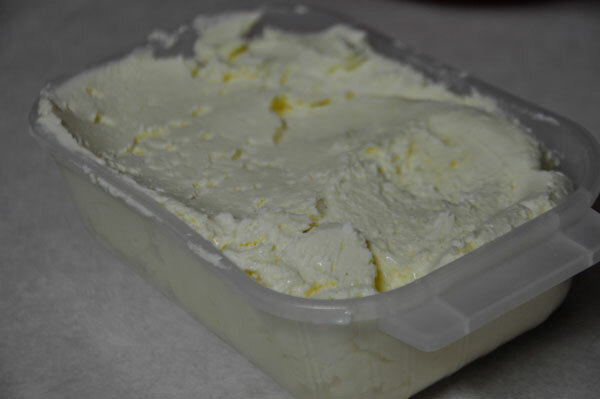 Place butter in a storage container and refrigerate. 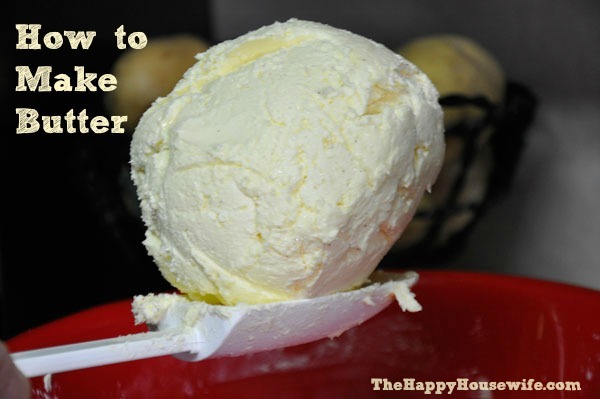 Butter can also be divided into small portions and stored in the freezer. Love this! As soon as I get a blender I’m going to try this. So, if I go to grocery store, will I find this in milk section, will it be labeled as “fresh cream”? I dont know if Ive ever seen it And also, after step 4, when you add the ice water and then mix and then drain, do you save that? or dispose of? 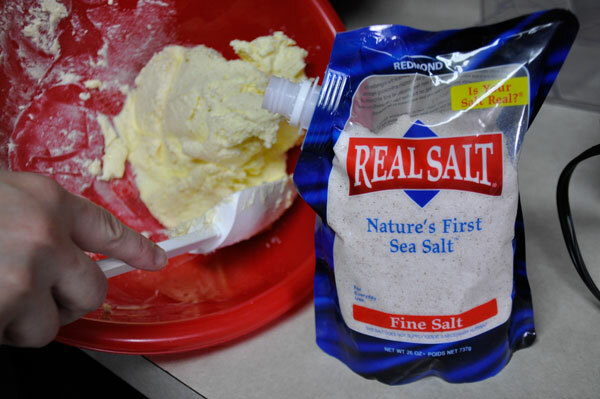 Its not real buttermilk like the first couple of steps i am guessing….Thanks!! 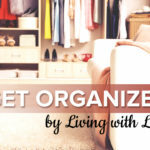 I always buy real butter and its expensive – wondering if this will be a frugal thing to try? Thank you!! When you say “fresh cream” does that mean fresh from the cow or will fresh from the store work too? When I was growing up we had jersey cows and their milk was almost half cream. My brother and I had the job of milking these cows. My mother would strain the milk and what we did not use she would let the cream rise. She would pour it into a container until she got enough to make butter then she would let the milk clabbor. It was put into a churn and we would churn the milk until the butter formed. Basically what you do. We would work the butter until we worked the water out of it and of course we had all the buttermilk we needed. I will have to try this in a blender. Thank you for sharing. I am a Christian wife of a retired Sailor and I have made quilts also. I am glad to see someone carrying on the traditions of time past. that’s just how i do it! except when i make garlic or honey butter 🙂 i never seem to catch it in time to get just whipped cream – how long goes that take for you ? It’s a bit expensive. Fun to do with kids, but I wouldn’t make all my butter like this.